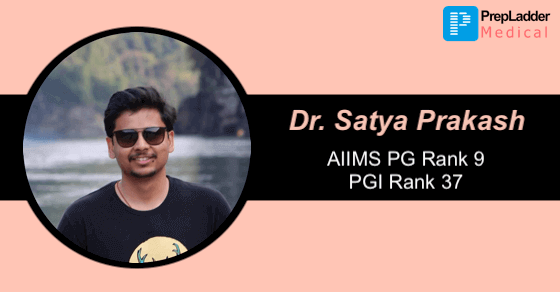 PrepLadder wishes heartiest congratulations to Dr. Satya Prakash for attaining AIR 9 in AIIMS PG and AIR 37 in PGI. We wish Dr. Satya Prakash all the very best for his successful career and future ahead. In this interview with PrepLadder he shares tips on how you can achieve your dream seat too. Dr. Prakash: My name is Satya Prakash. I have done my MBBS from AIIMS, New Delhi. I got AIR rank 9 in AIIMS PG November, 2017 and AIR 37 in PGI, Chandigarh November, 2017. Dr. Prakash: According to me, theory along with MCQs approach is much better as compared to practicing only MCQ’s, because there are a lot of conceptual questions which can't be solved simply by solving and practicing MCQs. Dr. Prakash: I started my preparation in the 6th semester where I joined a foundation course in one of the coaching institutes, although I didn't attend it very sincerely. I started my proper preparation for PG with full focus in my internship. At first, I tried to focus on basic concepts only and gradually upgraded my preparation. Dr. Prakash: No, with god’s grace and my preparation, I cleared it in my first attempt. Dr. Prakash: Revision carries a great role in ensuring a good rank, as it is nearly impossible to be able to memorize everything in just one reading. So you need to have a good revision strategy. One must spare at least a month for revision purpose. However, it is equally important to not read too less, because the questions tend to be quite varied and are asked from various topics. Dr. Prakash: I read an interview of one of the AIIMS PG toppers on PrepLadder, which helped me a lot to plan my preparation more precisely. Dr. Prakash: I joined a T and D course, which helped me provide a target for each week. Dr. Prakash: I have always been above average, but was not one of the toppers of my class. Dr. Prakash: According to me, ophthalmology and orthopaedics were the most difficult subjects whereas easiest ones were psychiatry and dermatology. Dr. Prakash: One must try to avoid changing their strategy or study material too many times. Rather, making a broad strategy and sticking to it through the whole journey of preparing for exam would surely be beneficial. What was your exam taking strategy? How many questions did you attempt in AIIMS PG? Dr. Prakash: Most importantly, I tried to remain calm and focused throughout. I had a good sleep the night before the exam. I reached the exam centre well in advance in order to avoid any sort of panic. I attempted 193 questions in the AIIMS exam, and probably got around 152 correct. Dr. Prakash: I would suggest every aspirant to try to study from standard books and preferences till the final year, and don't get too PG oriented till that time. If you are thorough with the concepts, it won’t take too many efforts to adapt into PG style studying. Moreover, a lot depends on what you do in those 3 hours of the exam, and it does indeed involve some luck as well. So just accept it and just try to give your best, without taking too much stress. Hope this blog will surely help you in your preparation. Just remember, hard work along with some smart work will always pay you back in a positive way.